Our first ever visit to the Plaza on Main Street started off with a bit of frustration. The staff who handled check in that day didn't seem well trained as to what they were doing and there was an excessive amount of confusion. This was unlike what we were used to experiencing at Disney, so we were hesitant, going in. Once chef Ken came out to talk to us, however, all was right with the world. Chef Ken was a charming and helpful cast member who chatted with everyone at the table and discussed how he could make us safe and delicious foods at The Plaza. He even shared some tips he has developed for making gluten free breads taste like normal bread. He was really great. I can't say enough good things about him. For our lunch, I opted for the vegetarian sandwich, but because of my dairy allergy, I couldn't eat all of the main ingredients, so he added some avocado and roasted the veggies, lightly. This was made very well and it's a nice vegetarian gluten free dairy free option, though not my favorite flavor combination. 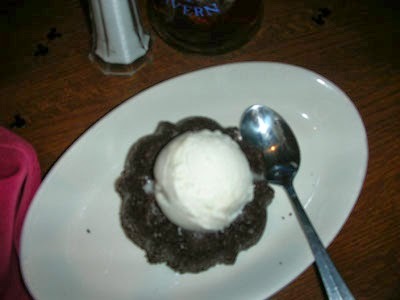 The fries are made in a dedicated fryer and this restaurant can do a variety of dairy free ice cream options and brownie options. My daughter had a burger with fries and house made chips. She said it was pretty good, but not her favorite burger ever. Chef Ken mastered the gluten free bread, and that was so delicious! If you go to the plaza, I hope you get a chance to meet the chef. He was the real highlight of The Plaza. 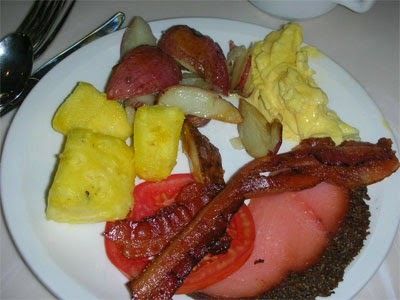 We had another delightful morning meal at Crystal at Palace this spring. It is always a family favorite. This time around, my daughter said "Mom, I would really LOVE it if the chef could make me a crepe. Do you think they can do that here?" I said that while they may not, there was no harm in asking. Well, the chef busted out the magic and brought her a savory crepe, which she adored. I didn't post the other photos because they are almost exactly the same as the ones below, so take a look, but everything was delicious. We had gluten free dairy free vanilla glazed donuts, and the chef offered us Mickey waffles, but we declined. You cannot go wrong at Crystal Palace! You certainly wouldn't ever guess it, but in my real life, I am a healthy eater. In Disney World, I consume crazy amounts of food, and what better place for that than the Crystal Palace. The chef came over and showed us what was safe to eat from the buffet (which was quite a bit). There were many gluten free dairy free options. 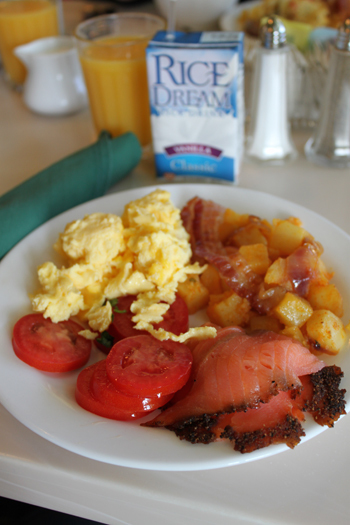 I notice the flavors of potatoes and eggs change from trip to trip, but there are still many choices. Something new for me was the quinoa apple hot cereal. It was ... weird. I like quinoa, but this was a bit odd. It was soaking in water, like a water based soup. There was way more water than necessary for the amount of quinoa, which was just strange. The flavor was a little odd, too. It was ok, and if I didn't have a plate full of delicious alternatives, I could have eaten it. But I let it go in lieu of the monstrous plate of food to the left. 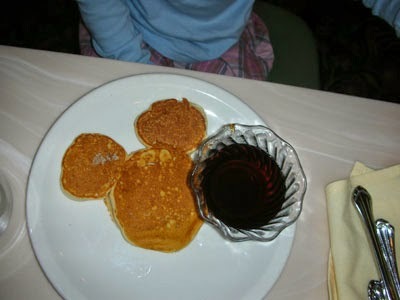 The chef didn't offer anything else at first, but my daughter asked if he could make pancakes. She loves gluten free pancakes for breakfast here! He said they had Van's waffles, which we politely declined and he said he would look for a pancake mix. 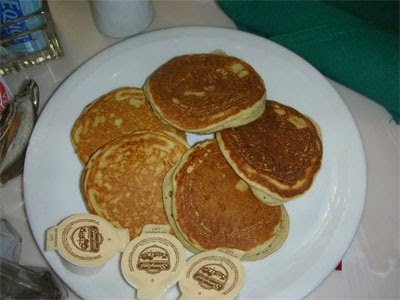 Lucky for us, he found what he needed and he made a double order of chocolate chip gluten free pancakes. A few minutes later he brought us out some donuts, so we were well fed and spoiled with options! 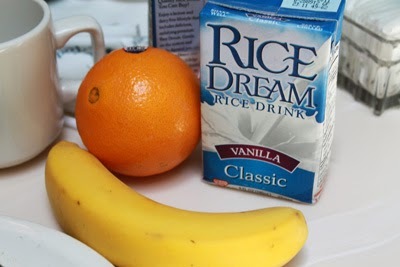 I used the rice milk in my coffee, and we enjoyed our breakfast so much. Also, our server was very nice, and the characters are darling, as ever. 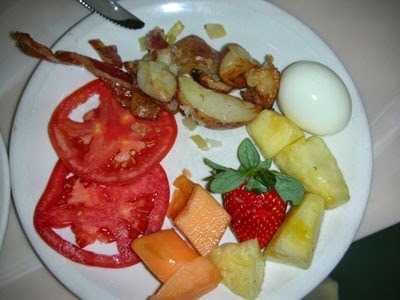 This is still my favorite 8am breakfast stop in Walt Disney World! Well, we braved the pre order option and used the filters to choose our Wheat Free Dairy free foods. We found out that if you do this, a chef will not be offered. They will just let you seat yourself and your food comes out. We were OK with this, but if you don't think you'll like that option, then you probably shouldn't pre-order. We found the system a little confusing because no one explained how it would work (no one said, go get a drink, or we'll find you, or you've already paid). But I was able to ask a very friendly cast member and we figured it out. 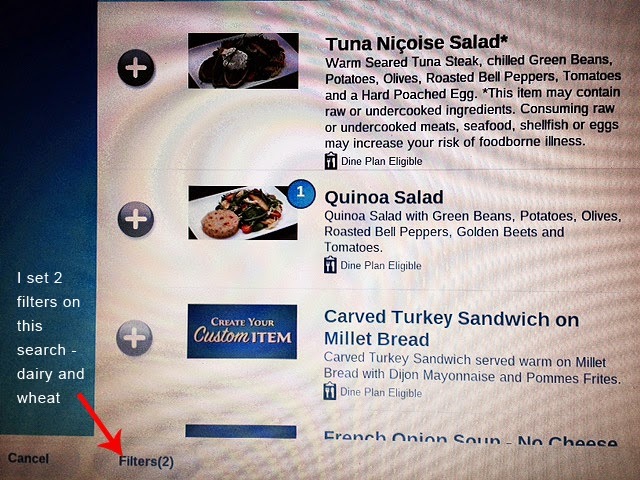 My husband was not excited about the system of ordering and he was already determined to dislike the meal. To his surprise it was his favorite of the trip. 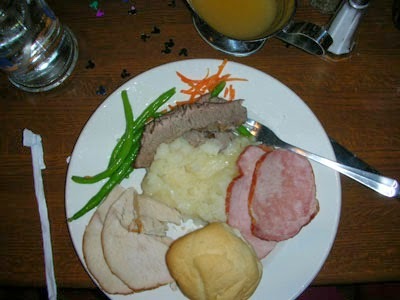 My daughter agreed that the pork roast was delicious! She absolutely loved her lunch and she proclaimed the green beans and potatoes were also very tasty. I chose the quinoa cake and salad, because I knew I would want a lighter lunch option. 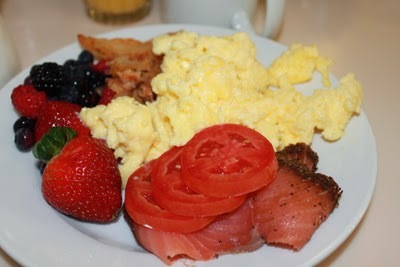 It was also quite good, but I only ate about half of it after such a huge breakfast. I was grateful I ordered light. The quinoa cake was well seasoned and the beat cubes on top were delightful. The olives chopped into the salad greens were a nice touch. Now, my daughter has always wanted to try a French Onion Soup, but we have never found one gluten free and dairy free. When you order the soup with the wheat filter, it gives you the option to eat the French Onion Soup without the bread crumb and cheese topping. This was confirmed on our receipt, so when I saw all the cheese, I sent it back. They brought out a second batch without any cheese and they explained that they did make it gluten free, but they left the safe cheese on for my daughter. It was not clearly labeled this way in ordering, so that was a bit confusing, and she ended up eating the cheese free version (which her tummy appreciated). She loved it, and she was so happy to have tried French Onion Soup, at last. The soup and entree were the stars of the show. My daughter was disappointed with the gluten free cream puff. She said the dough was very hard (rock like) and that the lemon filling was incredibly tart, which she did not enjoy. As it turns out, a scoop of rice dream would have been a better choice for her, but it was fun to try something new. I ordered the only dairy free option I could find, which was a sorbet. I chose the lemon sorbet, but it was bitterly tart. I ate a little, but left the rest behind. While Be Our Guest has mastered the lunch entrees, they have a room for improvement in the world of gluten free dairy free dessert offerings. We are still disappointed that the French Meadow Bakery items are no longer offered on property, or the babycakes in a restaurant like this. I did ask, via email, the Special Diet department if there were any other options for us, but they did not get back with an answer. So, this is what it is. We didn't walk away hungry and we had a wonderful, and quick, lunch experience. I'm sure you're wondering how we could possibly eat more food, but while waiting for the parade, I ran and got root beer floats from the Main Street Ice Cream Parlor. 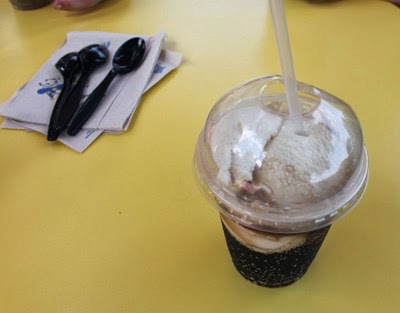 We love these toffuti root beer floats and they are a bit of a tradition on our Magic Kingdom visits. 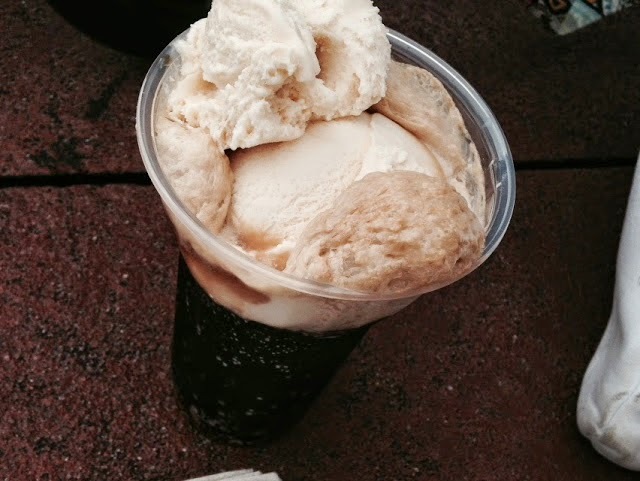 It is probably the only time I actually eat a root beer float, so it was quite the treat. Be Our Guest Fast Pass Ordering Information for Pre Ordering with Allergies. Click Here. I know, it is the same ol' same ol' from us, but we can't help it. 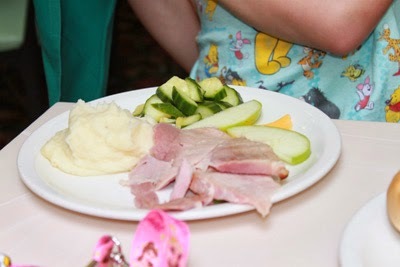 We love the food at Crystal Palace and we love the experience of dining at Magic Kingdom before park opening! It was the same wonderful attention, help, and food as always. I still recommend it. 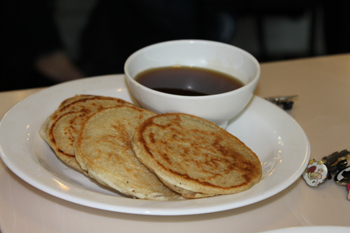 You can see our gluten free dairy free pancakes and safe items from the buffet, here. 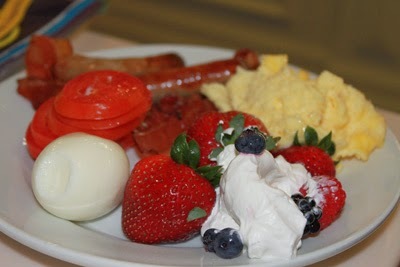 We always love Crystal Palace breakfast before park opening. It has been a family favorite, but this time some favorites have changed. The potatoes that we loved are a different variety with onions and peppers and less overall seasoning. The eggs that used to be gluten free and dairy free are no longer dairy free, so we ordered side of dairy free eggs. The last two times we were here, the whipped cream on the buffet was dairy free, but it was not this time. So, while the available options were still good, some of our favorites were not as good. Our chef did not offer to make pancakes or waffles, and instead, he encouraged us to eat a muffin. Upon asking for gluten free pancakes, however, he was happy to oblige. So, be sure to ask if there is something you were hoping for! Often the chef can accommodate. I did email Disney Special Diets 3 times before our trip to find out how they were handling allergies during the Christmas Party. I never got a solid answer, but when we got there, we found they were ready for us. We checked two different cookie handout locations and we found they were well stocked with gluten free (though not dairy free) butterscotch cookies. My daughter was able to eat these and she reported that they were very good. 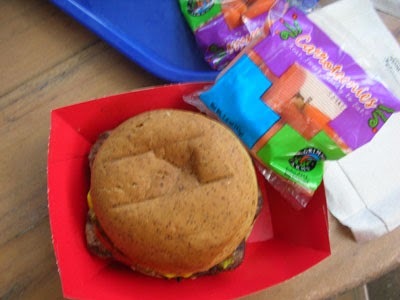 They also had apple juice available as well as carrots and apple slices. There was no trouble in requesting or receiving these items, and no need for a manager to come out regarding this particular product. 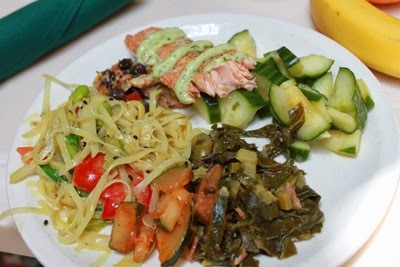 This counter service meal was the same as previous years, so I did not capture a new photo. 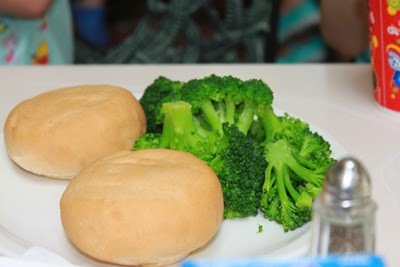 We received gluten free bun, burger, sides and the usual offerings of grapes, carrots, and a drink. Cookies and brownies from French Meadow Bakery were available. How do you get disney to do all of this? Do you notify them when you book your trip? Ashley, the chefs are well trained in the Disney property restaurants. You don't need to plan ahead. Just let your server know of your allergies as you sit down. They will then bring the chef out to discuss your options. They are well prepared for many dietary restrictions. I live in Orlando and am an annual pass holder -- I've NEVER had a problem getting a GF version of anything -- from brats in Epcot to desserts or cornbread. I've eaten at the highest-end and lower-end eateries, all with exceptional service and never having a bad experience -- they are WONDERFUL at making sure food is 100% GF! Does Tony's Town Square Restaurant have dairy free red sauce or pizza's? Tony's was my husbands favorite meal of the trip. They made him a GF seafood pasta and bruschetta for app.